We are partnering with Water Rangers, a Canadian NGO, which provides water quality test kits, allowing us to use them on our sailing trips, uploading the data to open source software which is used to monitor changes in ocean water quality. We are also partnering with a social association that will provide kits for us to help clear the plastic and other products that we encounter. 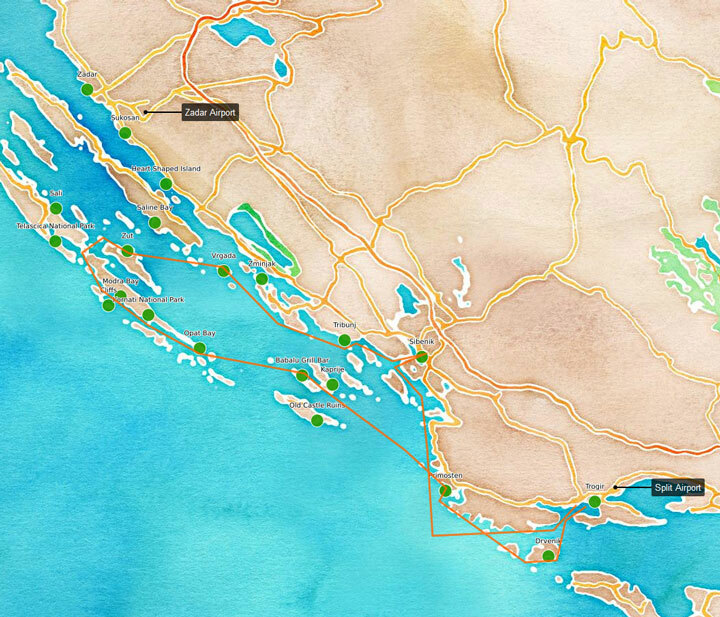 We support Kornati and Telascica national parks by mooring there and paying mooring fees and respect the environment and wildlife. We support local cultural attractions, especially those which are run by local people and avoid any performing animal events. By visiting remote and uninhabited bays as well as historic, inspiring cities, such as Sibenik and Zdar, we want to show people the beauty of our planet. We want people to be inspired to stay out in the nature and therefore learn to appreciate and respect it. Once participants snorkel every day and see the clarity of the water and rubbish on the sea bottom, once participants sail and feel the wind, once participants hike and watch sunsets together and see the beauty of the surrounding area, once participants see the clear night sky with thousands of stars, once participants do all these for a week, every day, they learn that our world is really unique and needs preservation. We tread lightly in the places we visit, such as Zdar and Sibenik and make a priority to support attractions that directly benefit local people. We avoid international and chain type establishments. We have especially made great links with family run restaurants over several years, such as Babalu Grill Bar and a secret location on Zut island! They create a great atmosphere for our clients and we know that every penny will go to local people.